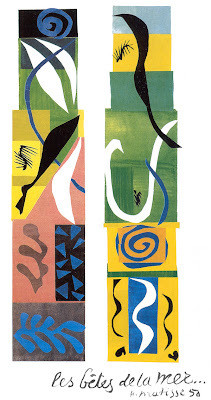 For several years I've been sharing Matisse's Beasts of the Sea with teacher education students. After introducing his work and life, and the unrelated format of a triptych, I demonstrate how they can make a Matisse Triptych geared toward first or second-graders. We talk about organic shapes and abstraction; it's easy for these non-artists to see the influence of sea forms in the piece, and how he might have gone about abstracting them. This triptych is the work of a college student. 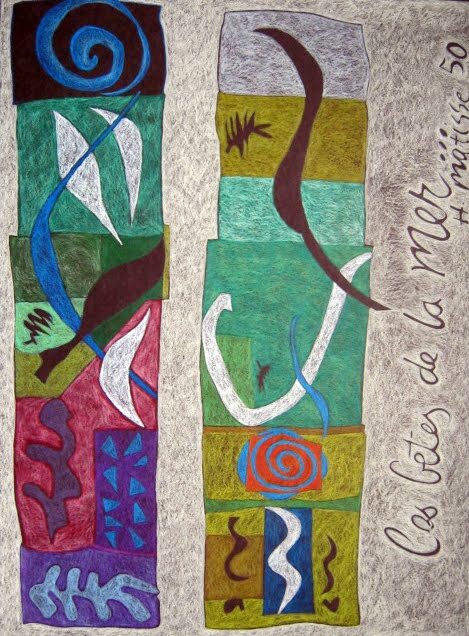 I decided to try my hand with colored pencil on black paper, to recreate the geometric shapes behind the organic ones, to see how Matisse isolated the shapes or let them flow into each other. I didn't strive so much to match colors or technique, but to try to experience the composition and create an homage to the bold and graphic images Matisse created late in his life.